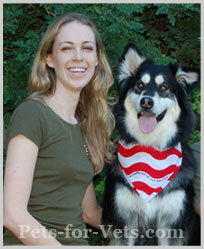 Today, we have the honor of interviewing Clarissa Black, founder of Pets for Vets. The Pets for Vets program supports our veterans and provides a second chance for shelter pets by rescuing, training, and pairing them with America's veterans who could benefit from a companion animal. What gave you the idea for Pets for Vets? And how did you get started? While volunteering at the Long Beach VA hospital, I observed how the veterans responded to weekly visits with my dog, Bear. They always asked if Bear could stay with them. It occurred to me how beneficial it would be for a veteran to have his/her own dog 24/7 when a briefly visiting dog had such a positive impact. My background is animal behavior and training so I knew how important selecting and training the right dog for each veteran would be. Everything just fell into place as I developed the program. Where do you get the pets from? How do you choose them? 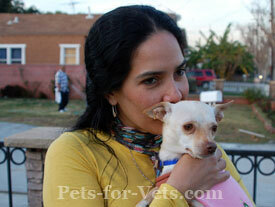 Pets for Vets rescues the animals from shelters and rescue groups. We identify the veteran first and then look for a dog or cat (the veteran specifies which he/she would like) to complement the veteran’s personality and to fit seamlessly into his/her lifestyle. How long does the training take? Who trains them? The length of training depends on each particular dog/cat. All of our rescues are trained to CGC standards by experienced trainers. If anyone is interested in volunteering with Pets for Vets, there is a Volunteer Application and a Trainer Survey available on the website. How do you match the vets with the pets? Do you meet with them before you pull a dog or do you have dogs already in training and match them based on their personality? A veteran submits an application and then our trainers get to know the veteran through phone interviews and in-person visits, including a home visit. The veteran is identified first then our trainers begin the search for just the right dog to match the veteran’s personality and lifestyle. How do the vets find you? The veterans find us through VA hospitals, Vet Centers, our website and word of mouth. Most of our veterans have Post Traumatic Stress Disorder, Traumatic Brain injury, anxiety or depression. Pets for Vets believes that companion animals can be a life saving therapy or friend that many returning servicemen and women need. Pets for Vets matches have helped veterans feel comfortable turning off the lights at night, feel safe while walking in public, wake up from night mares, decrease the number of nightmares, decrease the amount of medication needed and more. 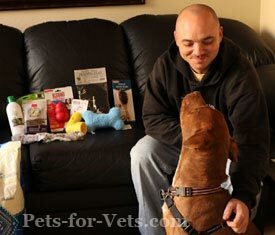 Please visit http://pets-for-vets.com/stories-2/ to see some of our amazing stories. How many vets have you matched with dogs? In CA we’ve matched twenty dogs with veterans. We’ve also made 3 matches in Seattle, 3 in Michigan, one in Florida and one in Washington, DC. Our funding comes from individual donations and grants. We were fortunate to win a Pepsi Refresh grant determined by online voting. That grant helped us establish chapters in other locations. To donate to this wonderful program, click here. To volunteer for Pets for Vets, click here. 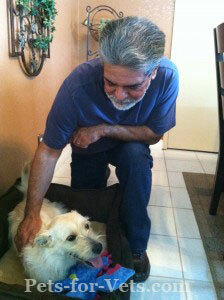 If you know a Vet who would benefit from being matched with a pet, they can click here. Like Pets for Vets on Facebook. Browse their website to learn more about their program.